Ok that is a long title. But still let’s talk about some of the technically true, but not necessarily helpful advice that gets tossed at families from time to time. I find posters like this discouraging. Like my hard work is worthless and I should be dancing in the daisies all day with my fairy children. Patience, Responsibility, Hard Work, Respect, and Commitment are not best taught laying on the floor with Lego. Balance, Resolve, Forethought, and Selflessness, are modelled by our everyday loyalty to our families. Damn dishwashers and microwaves! Posters like this are technically correct. Despite Futurama insisting that being technically correct is ‘the best kind of correct’ these posters can be really discouraging. At some point dishes and laundry need to be washed. At some point toys need to be pick up and put away. At some point the floor needs to be swept and/or vacuumed. At some point a more time consuming and nutritious meal than a pizza or a hotdog needs to be prepared. I could go on but you get the idea. At some point those chores that your are putting off so you can be a good present parent will need to be done. I think there are three things wrong with posters like this; One I think they produce more parental guilt than they relieve. Two they force parents to try to do ‘everything else’ in that brief window between when your kids go to bed and when you go to bed. And three they rob kids the chance to learn that sometimes you have to do work when you don’t want to. I am going to expand on those one at a time. 1- Parental Guilt- Clutter really bothers me, but it doesn’t tend to bother Meghan near as much. This has caused us some stress over the years. I hate toys being scattered around the livingroom. As soon as my kids stop playing with them I want to start picking them up. Meghan doesn’t mind leaving them there because she knows they will likely return to the toy in a little while. Some people have a much lower tolerance for mess and clutter than others. Posters like this make me think, ‘Am I killing fun’ for the sake of my comfort? I don’t think my distaste for mess makes me less of a parent than the parent who never cared if their space was messy to begin with. 2- In Between Their Bedtime And Your Bedtime- This time is golden for marriages. It is likely the only time you get to be a couple again, even if it is only for a few brief hours. Also this time is golden for reclaiming some of your own individuality. During these few hours I try to; snack on food I don’t want to share with the kids, enjoy a movie/TV show with Meghan, play a video game, blog, read a book without pictures, get together with friends, etc. If all of our housework has to happen after the kids go to bed then I lose the chance to reconnect with Meghan, my friends, and myself. 3- People Have To Work When They Don’t Want Too– I would love to play all day, everyday, forever. I would love to live in a world where ‘being an awesome parent’ paid really well. But I don’t live in that world. I also don’t live in a world where I can not do most things simply because I rather be doing other things. This is an important lesson for kids to learn. Don’t rob them of the change to know that you do things that are not very fun so they have the things they want when they need them. I am sure your child doesn’t want to eat tonight’s supper on yesterdays dirty lunch dish. These posters are technically correct. We don’t need perfect houses that are always spotless, where all the laundry is always done, and every meal could be a photoshoot for the Canada Food Guide. 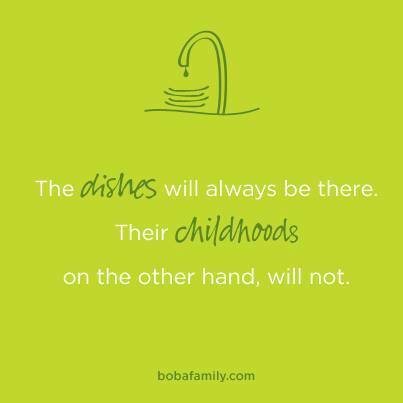 Sometimes it is OK for the dishes to wait. But sometimes it isn’t. Seek the balance that works in your house. We are still looking for ours. I agree that yes, we should not spend time obsessing over our homes being spotless but it should be kept tidy and clean for our kids sake, they thrive in clean, organized homes. Secondly, I love my kids and I love time with them however, it is not my job to entertain and be with them every waking minute, in fact, I think that would do them a disservice. They need time with their siblings if they have them and learn to play alone which is extremely valuable, in my opinion. yes, our kids grow fast and we need to enjoy them, but cannot forget that we have important lives to attend to as well. I think finding a balance among it all is the goal even if a lofty one. This post is totally written in sermon form! 🙂 Ha. You make great points. These posters tend to tick me off, as do blog posts that tell me to get off my phone or the computer while I’m “parenting”. “Look at your child through your eyes not through the viewfinder on your phone.” Those posts tick me off even more. I think there is space for these time of posters that you show above. I think they are great for sharing with friends when your friend really just wants an excuse to not do it all for a bit. I’ve done that. When they post “I’m just so tired from my day but the dishes still need to be done” I can kindly reply, “the dishes will still be there tomorrow. Sometimes it is okay to take a break and focus on yourself/your kids a little more”. But you’re right – often they are used to guilt. And I don’t like that. Yes, Christopher! You said it! Thank you. Love it! Thank you for writing this! I just saw that meme on Facebook this morning. I do have to say that to myself sometimes because I tend to let not getting all the cleaning done work me into a tizzy. However, these things DO cause unnecessary parenting guilt and that is completely unhelpful. I’ve been looking into the Charlotte Mason way of homeschooling and that had been helping me chill out. She really advocated for children doing most of their play without mommy/daddy so they can use their imagination, practice attention, among other benefits. Parenting guilt is the worst.